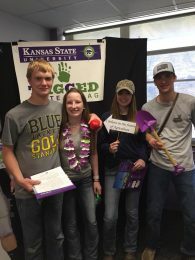 The communications and agricultural education department hosted the “Tagged to Teach Ag” event on April 30. This event brought more than 250 FFA members from high schools across the state to the Manhattan campus to learn more about what it means to be an agricultural educator. 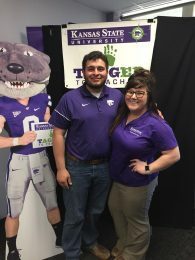 Current Kansas State University agricultural education students and faculty gave presentations about the program and future career options. Information about the agricultural education degree and other K-State programs was also available. FFA members also enjoyed ice cream from Call Hall and fresh cookies from the grain science and industry department while they played interactive games, collected “ag swag” and prizes and took photos with Willie the Wildcat at the “Tagged to Teach Ag” photo booth.